Football - Carrington v Hollins Holme. Damon Nichols-Gledhill for Carrington and James Chadwick for Hollins. 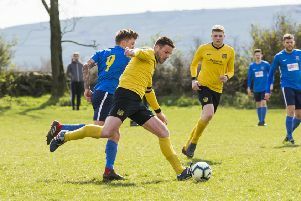 It is business as usual for champions Carrington, who are already in a familiar position at the top of the Ziggy’s Metro Cars Halifax Sunday League. They followed up their opening 7-1 win over Barge with a 5-2 eclipse of Hollins Holme on the Trinity Academy all-weather pitch at the weekend. Two fine strikes from central midfielder Andrew Butterworth, the first from a free-kick, had the Calder Valley side level at 2-2. However, Carrington moved up a gear and snuffed out the visitors’ hopes with three goals in 10 minutes. Hollins’ new boss Steve Parker, who has taken over from long-serving Joel Booth, knows Carrington are the team everyone has to beat in the chase for silverware. Parker said their hosts’ fourth goal, rifled home by Damon Gledhill-Nichols, had been Carrington’s best and the killer blow. “They are a class act,” he said. “They were not at full strength and we thought they were there for the taking at half time. Queens Hotel also have six points after a 6-0 win over a Top Club side who were opening their campaign. Barge FC manager Matthew Bagshaw was pleased with his side’s opening 30 minutes against Waiters Arms but left fuming by a horrendous collapse that saw them fall to a 10-1 defeat. Mount Tabor and Feathers, both beaten in their first outings, took a point each from a 2-2 draw. Lee Mount and King Cross Park are the pace setters in the middle section with two wins each. Lee Mount found themselves two goals down to Old Pond at Shroggs Park, after Jack Normanton had hit the bar for them. Dave Lawrence headed the visitors in front and Hayden Lewis rocketed home a second but man of the match Rohan Ford replied just before the break. Mount dominated the second period, with Pond a threat on the counter, and goals from Normanton, Ford and Gareth Gaukroger fired Mount 4-2 ahead before Paul Taylor had the last word for Pond. In Division Two, North Bridge played at their new Lane Head home for the first time but lost 4-2 to Fountain Head. Premier Division: Barge FC 1 Waiters Arms 10, Carrington FC 5 Hollins Holme 2, Mount Tabor 2 Feathers 2, Top Club 0 Queens Head 6. Division One: Beehive & Crosskeys 12 Halifax Rangers 0, King Cross Park FC 3 Oddfellows 0, Lee Mount 4 Old Pond 3,Ryburn United 2 Ryburn Valley 5. Division Two: Halifax Rangers Reserves 1 Bradshaw 8, North Bridge 2 Fountain Head 4, Ovenden Phoenix 3 Halifax Amateurs 4, Weavers 4 Triangle 2.